My original thread vanished. So I guess this one is Studio Thread Junior. I have way too many builds in my studio to go back and add them all, so I'm going to just stick with the ones I'm making here on out. If you're interested in my studio in general, click here to take a look! I own all the EPs, all the SPs, and all the Store. My creations usually include a mix of everything. I rarely use CC but if I do it will be listed. A beautiful oasis in the suburbs! Five bedrooms, three baths, main floor master suite, garage parking for two vehicles, swimming pool, and basement game room! All appliances upgraded. The Clothing Hamper by Full Load, Inc.
Hydroglide Waterslide by DeLuge Inc.
From the venue "Now and Then Century Manor"
I am so sorry that your original builds thread has disappeared It is not nice at all that this occured. The exterior design of Avondale is very nice! Very nice roofing! The exterior wall textures look very nice together. The plants and flowers nook in the front area of the home looks very nice. The layout and furnishing of the interior of the home is very nice! The two storey entrance looks great! Very nice fireplace. sofa and armchairs sitting area in the living room. Sims will enjoy relaxing watching tv or reading a book, and warming up near the fire. The plants are nice touches of nature either sides of the fireplace. They will have fun dancing to the stereo music! Very nice design of the kitchen! It is a very nice light filled room! The windows breakfast nook is such a sunny place for sims to enjoy eating a meal in the sunshine! The L shaped bar stool counter and workbench looks great! The red colour of the seating looks nice. It is nice that there is a separate dining room. The dining room wall colour is calming. Very nice furnishing of each of the bedrooms! They look very nice! It is great that there is a basement games room. Sims will have fun playing foosball, table acade games and table tennis there. Very nice pool patio in the backyard! The rock waterfall feature is very nice! 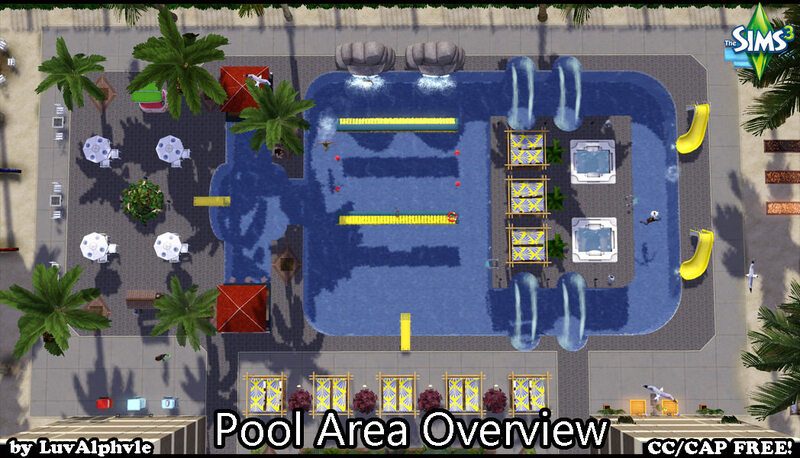 Sims will have fun swimming in the pool or enjoy relaxing poolside on the loungers. They will enjoy cooking on the bbq and dining in the outdoors air. It is a very nice family home! 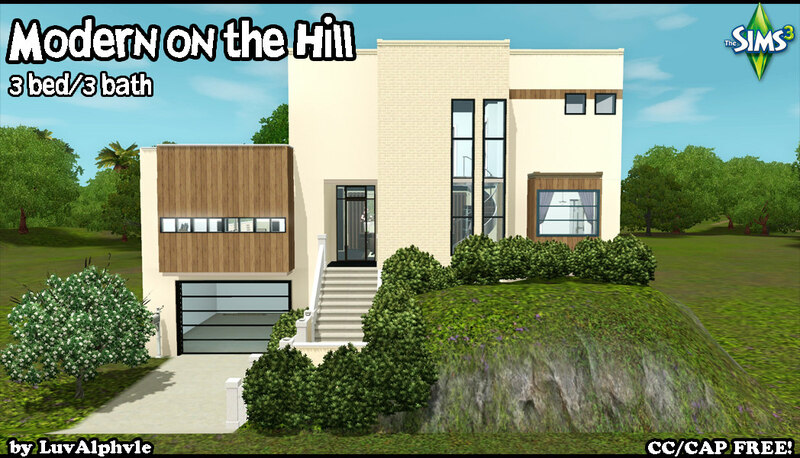 This elegant three-bed, two-bath home has been built into a hill for a unique floor plan! The narrow lot will fit anywhere but there is plenty of backyard space. All appliances upgraded. The exterior design of Modern on the Hill looks great! It looks great that it is built into the hill! The types of windows used looks nice. Very nice pool and outdoors dining back patio! The floor tiling looks very nice. Sims will enjoy relaxing poolside under the shade of the umbrellas on the loungers. It is nice that there is a fire pit on the ground level for sims to enjoy sitting around the fire keeping warm and toasting food. The red colour of the seating looks great! They will enjoy relaxing in the hot tub. Very nice layout and furnishing of the interior of the home ! The brown colour scheme of the living and dining area looks nice. It looks nice how the arnchairs and sofa are placed in the living room, for sims enjoy chatting. Very nice dining room! The chairs look great on each side of the table for sims to enjoy dining together, with sunshine coming in through the windows. The wooden texture of the cabinets and counters in the kitchen gives a nice look to the room. Very nice design of the bedrooms,The wall pattern in the kids room look very nice. It is great that there are double bunks in the kids rooms, The peach colour of the beds in the girls bedroom looks nice with the peach curtain and green wall colour. Very nice corner computer nook on the upper landing! Sims will enjoy sitting at the desk table using the computer. The plants wall pictures look nice there. Very nice family room! Sims will enjoy sitting on the sofa and armchairs watching tv together, or enjoy listening to stereo music, The aquarium is restful for sims to look at the fish when sitting there. It looks very nice how the pictures have been placed on different levels on the wall. Sims will have fun playing pool. Thank you @rosemow ! I'm trying to build my thread back up. Start small and move up! There are three available apartments in this building. Studio (§15,758 furnished; §9,826 unfurnished), one-bedroom (§29,934 furnished; §15,907 unfurnished), and two-bedroom (§51,129 furnished; §23,367 unfurnished). Currently the studio apartment is marked as the player apartment and the others are NPC apartments, but if you'd like to switch that around you can move the lot markers. On the ground floor is a community laundry room and gym and spaces for expansion if there are other things you'd like to place. 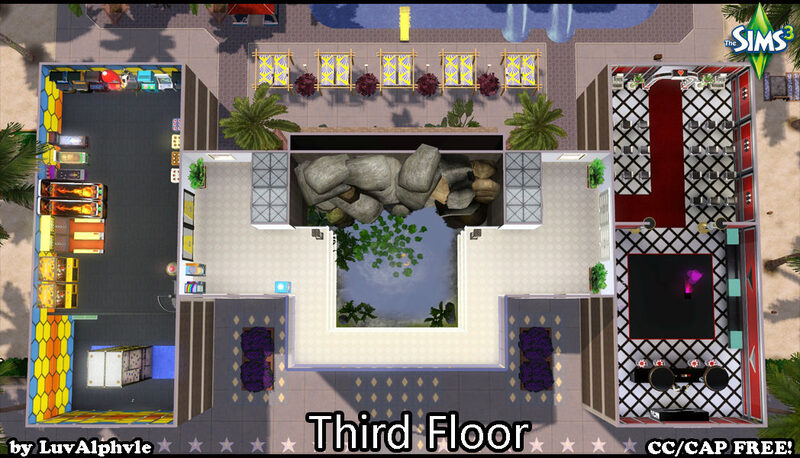 If you have issues with the "go up a floor" button, click on "use stairs" instead and your Sim will climb to the next floor. 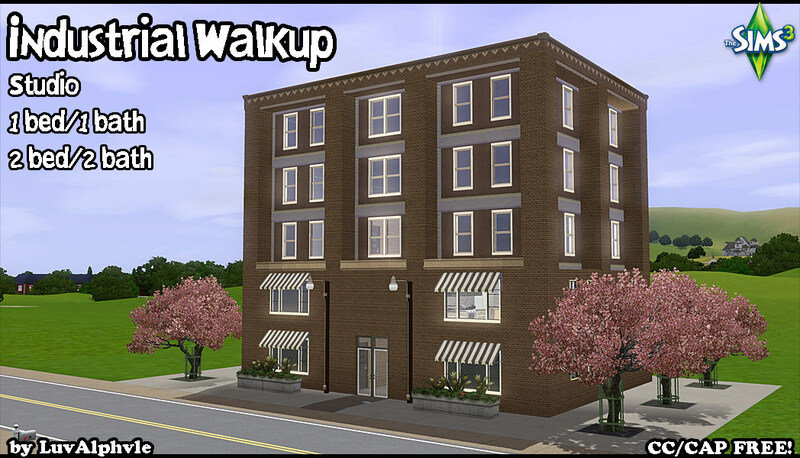 The design of Industrial Walkup is great! It is great that there are different types of apartments, from a studio to a 2 Bedroom unit. The furnishing and layout of each of them looks very nice! The brick and other wall textures reflect the industrial theme well. Very nice tv watching areas in each of the apartments. It is great that there are community gym and laundry room areas. Very nice exterior of the building! The windows look very nice how they are placed there and the awnings are a nice touch over the windows that are on either sides of the entrance door. The cherry blossom trees look very pretty! This modern beach home has four bedrooms, two baths, open concept living and dining, plus a two-level back deck where you can go fishing, soak in your hot tub, or entertain your friends with your outdoor kitchen. Carport parking for two vehicles (not included) and mooring posts for three boats (not included). All appliances upgraded. This home was built at 33 Surf Circle in Isla Paradiso. If you place it there everything will format correctly. If you place it in another coastal lot you may have to edit the terrain to get it to look right. Modern Beach Home looks a very nice and relaxing home to live in! The layout of the bulld looks very nice! Very nice outdoors areas! Sims will enjoy relaxing in the sunshine on the loungers on the lower porch and resting in the hot tub. They will enjoy cooking on the bbq and dining outdoors on the upper porch. Nice nook area on the porch for sims to enjoy relaxing on the sofas having a drink from the bar. They will enjoy using the telescope and have fun playing chess on the upper balcony. Sims will have very nice sea views from their home! The two vehicle car port looks great! Very nice furnishing and layout of the interior of the home! The open plan living area is very nice! It looks a very nice light filled home for sims to enjoy the sunshine coming in through the windows whilst dining at the table or sitting relaxing on the sofa and armchair watching tv. Very nice stylishly nice black colour scheme of the home! It is a very nice modern beach home! Thank you @rosemow for always being so sweet. 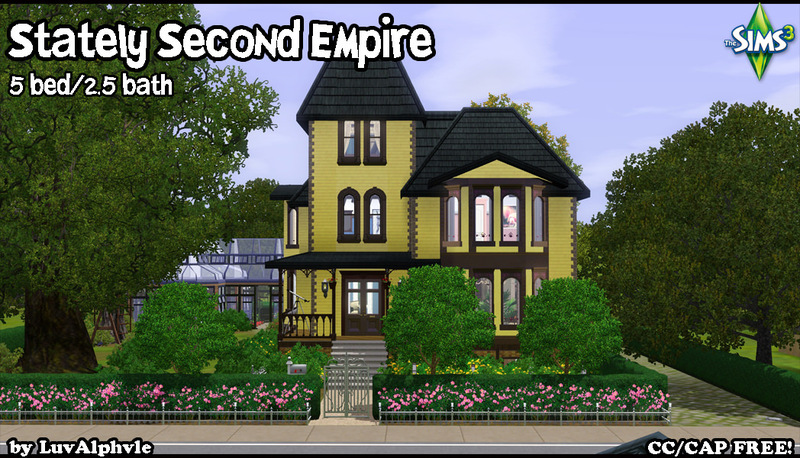 Once falling into disrepair, the Stately Second Empire has been purchased and restored. 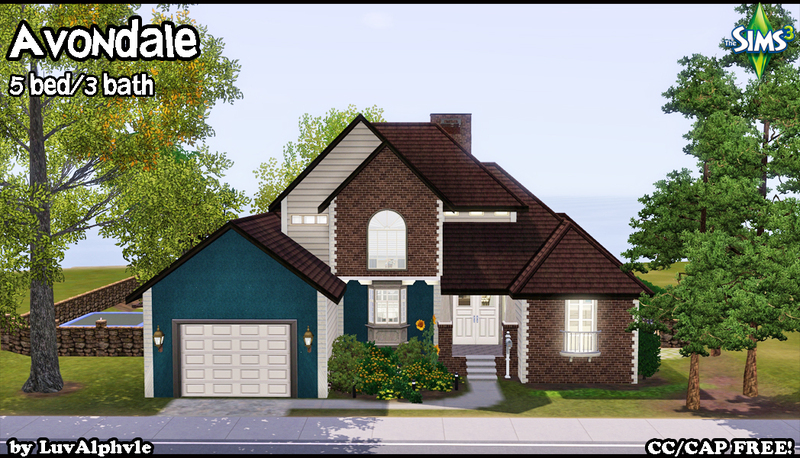 The house includes five bedrooms (with third floor master suite), 2.5 bathrooms, formal living and dining rooms, office, family room, and hobby room (empty so you can fill it with your own hobby items). The carriage house in the back has been converted to a three-car garage (cars not included), and the space upstairs can be converted into a mother-in-law suite or anything you need to use it for. Perfect-quality produce grows in the greenhouse and on trees in the yard. All appliances upgraded. From the venue "Deliciously Indulgent Bakery"
From the venue "Gothique Library"
From the venue "Grandpa's Grove"
From the venue "Stones Throw Greenhouse"
The exterior design of Stately Second Empire is very nice! The tower, roofing , dormers, type of windows used and yellow colour of the exterior looks very nice! It is great that the carriage house is now a three car garage. Very nice greenhouse! 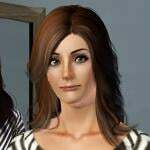 Sims will enjoy growing plants there and gardening with sunshine coming in through the windows. Kids will have fun playing on the playground equipment and in the treehouse. Very nice layout and furnishing of the interior of the home! Very nice sitting area on the living room for Sims to enjoy resting on the sofas listening to the piano music with sunshine coming in through the windows. The kitchen looks very stately! The type of cabinets and counters used looks very nice. Very nice curtainrd windows dining alcove for sims to enjoy eating meals at the table in the sunlight. The colour schemes of the bedrooms look very nice. Very nice family room! It looks nice that the armchairs have been placed either sides of the sofa. Sims will enjoy sitting relaxing on the seating watching tv together. Well, it's been a while since I uploaded! I've just been trying to actually PLAY the Sims instead of just building all the time. Trying to get a legacy family past three generations, since I usually just get bored. But anyway. This Prairie-style home features 4 bedrooms, 3.5 baths, home office, eat-in kitchen, garage parking for 3 vehicles, swimming pool and playground in the bacyard, and game room and hobby room (hobbies not included) in the basement. All appliances upgraded. 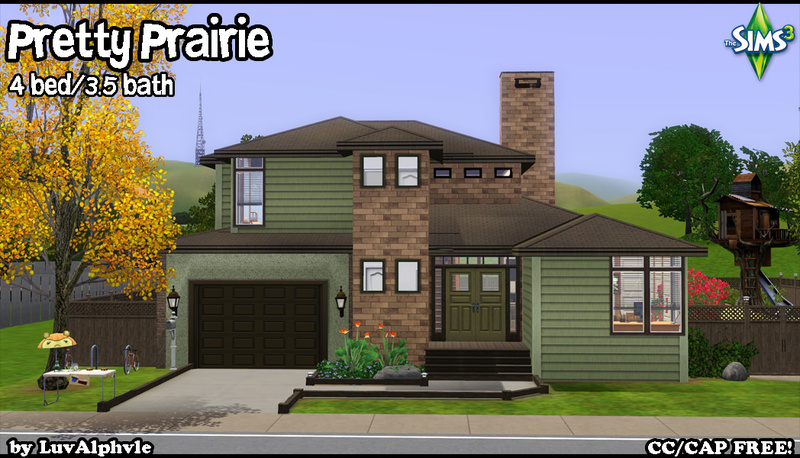 The design and layout of Pretty Prairie is very nice! The combination of the brown brick and the green wall texture gives a very nice look to the home. Very nice layout of the interior of the home! It is great that there is a basement with games and hobby areas! Very nice sofa and armchairs sitting area in the living room, for Sims to relax and watch tv. The corner windows study desk nook in the office is very nice! It is a nice place for Sims to enjoy sitting at the table using the computer or reading a book, with sunshine coming in onto them. The design of the open plan kitchen and dining area is very nice! Sims will enjoy nice views of the outdoors whilst eating a meal at the table. The wall tiling adds a very nice look to the room. Very nice green, pink, blue and yellow colour schemes of the bedrooms. The pink curtains, pink wall pattern and butterflies in the girls room look pretty! Very nice backyard areas! The pool patio is very nice! Sims have fun swimming in the pool, or enjoy relaxing poolside on the umbrella covered loungers. The waterfountain going into the pool looks very nice! Kids will have lots of fun playing on the playground equipment. It is a very nice family home ! After a few days of my launcher showing the blue screen of death, it's finally back to normal so I can upload my newest build. This large five-bedroom home is a great place to spend all year round! The decorations and activities in your home change with the seasons! Home includes main floor master suite, two-story family room with overlooking upstairs hallway, hobby room, parking for four vehicles, plus a dojo for your budding martial artist and a place deep in the basement to keep all your tomb treasures. Lots of fun things to do in the backyard, from floating in your pool to having a water balloon fight to soaking in your hot tub pavilion under the flowers. Throw parties every season in your basement party room! Mysterious "floating car" included, as it was left when the former owners fled in a bit of a hurry. All appliances upgraded. Seasonal lot marker located outside by front door. The exterior design and the layout of A Home for All Seasons is very nice! It is great that the furnishings and activities items change with each season! The furnishing of the Winter and Fall party rooms, and the Summertime backyard looks great! Very nice greenery covered pergola hot tub area. 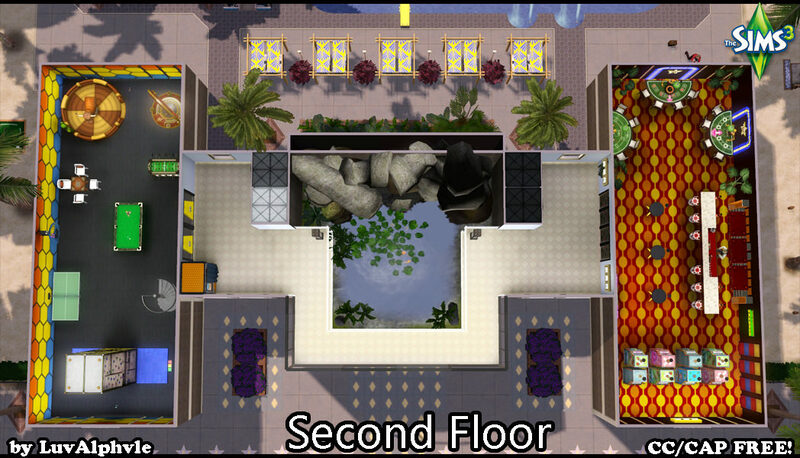 Sims will enjoy relaxing in the hot tub, It is very nice that there are two basements in the build. 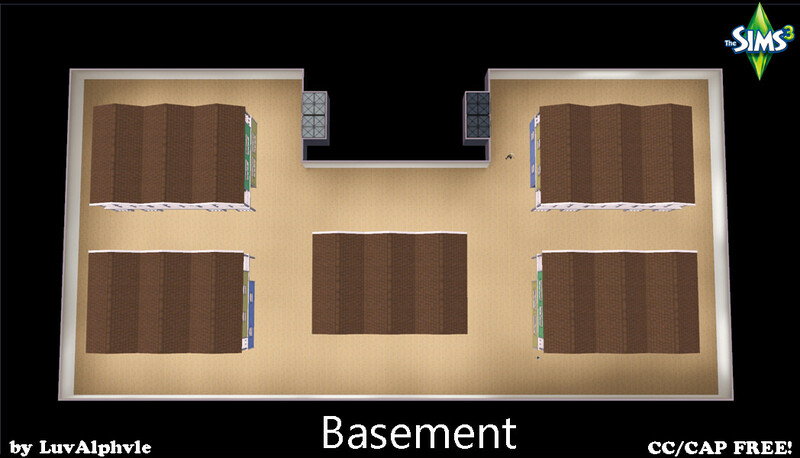 It is great that the basement levels hold the party room, a dojo area, tomb and treasure rooms, and a nectar cellar. Very nice furnishing of each of the five bedrooms! It is a very creatively designed, seasonal home! Sorry to hear your first thread vanished. Glad you're keeping at it, though. 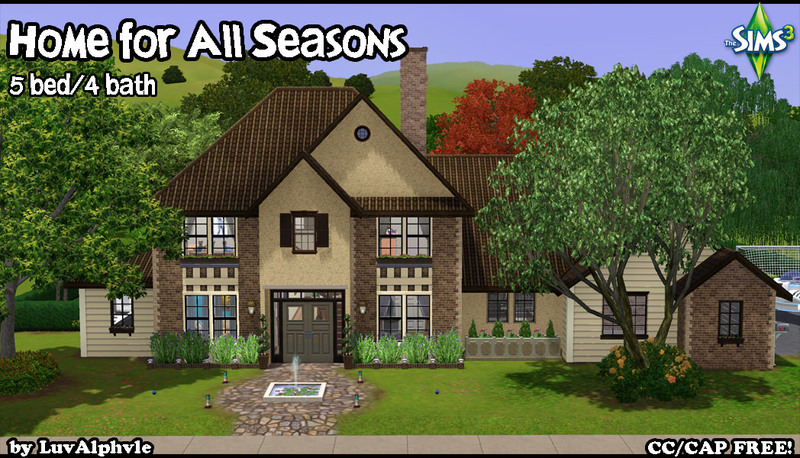 I really like the look of "Home for All Seasons." It's very unique looking! Thank you @rosemow and @60smusicluvr ! 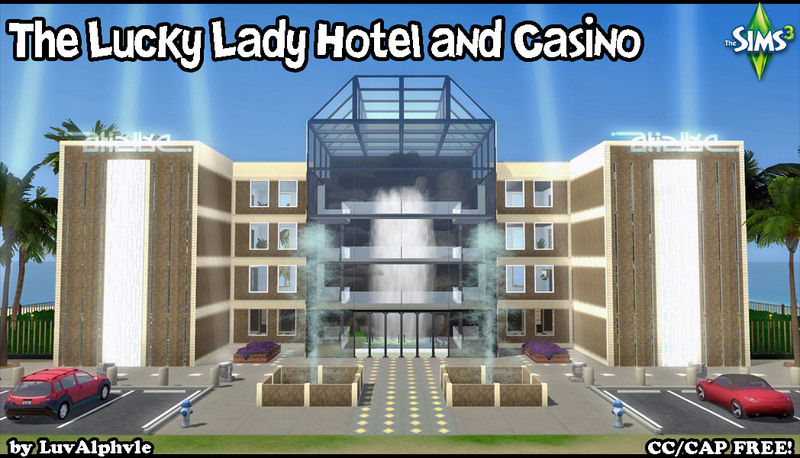 Welcome to the Lucky Lady Hotel and Casino! Our slots are hot and our tables are paying out! This five-star resort has everything you need for a vacation the whole family will love! ● First Floor Amenities: Your vacation begins when you walk in the door and experience our exquisite four-story indoor waterfall, which cascades into a tranquil goldfish pool. Our check-in desk personnel are available to make your arrival quick and pleasant. They are knowledgeable about the area so if you have any questions, ask! Mosquito spray is available here for a small fee if you forgot to pack it in your luggage. Our chefs have worked tirelessly to create a menu everyone will love and our dining room is open 24 hours a day to cater to your cravings. If you prefer to work up a sweat, visit the exercise room and afterward enjoy a refreshing steam to recuperate. For those of you who are traveling with little ones, our toddler room is also on this floor. ● Second Floor Amenities: Our casino is the place to be to place your bets! Come try your luck at our poker, roulette, and blackjack tables. Our dealers are the hottest bots in town! We have a great selection of slot machines and they're all on fire! If you need a break from gaming, walk up to the bar and order the special. Doors are set specifically for adults - no kids allowed in the casino! 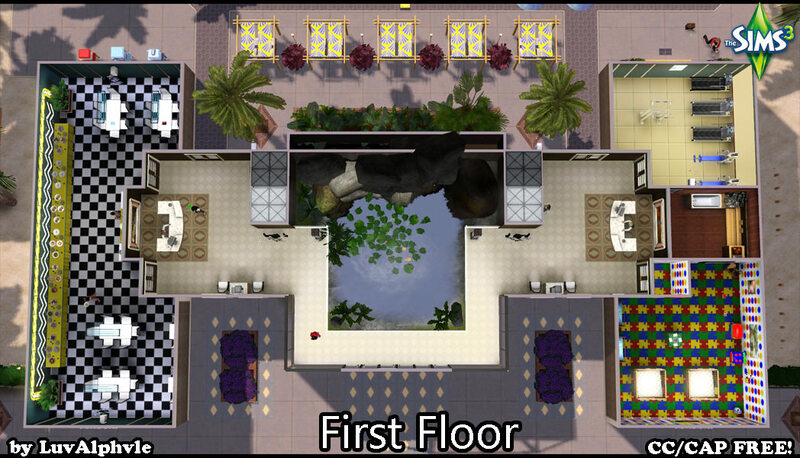 But we haven't forgotten the younger vacationers - on this floor we have the first floor of our two-story game room. Try your skill on our rock walls - even race your friends! - or challenge them to a game of pool. Show off your skills on the Buck & Chuck Bronco. Also available are dominoes, table tennis, foosball, and gyroscope - but make sure you're not prone to motion sickness for that last one! ● Third Floor Amenities: The second floor of our two-story game room is packed full of electronics to buzz and ping and whir their way into your perfect vacation! Enjoy skee ball, basketball, pinball, whack-a-mole, and plenty of arcade games. Here you'll get a bird's-eye view of those brave souls attempting the summit of the rock wall. Are you feeling particularly lovey-dovey and reckless? This floor is where you'll find our wedding chapel. Reservations are encouraged but not required, because we understand that sometimes these decisions are made spur-of-the-moment. (Divorce attorneys not provided on site.) A party room with bar and dance floor is attached to the chapel so you can boogie down with your new spouse after you say "I do!" ● Fourth Floor Amenities: After your day of fun, retire to one of our eight themed VIP rooms. Six of the rooms are double-occupancy; two rooms are family suites. 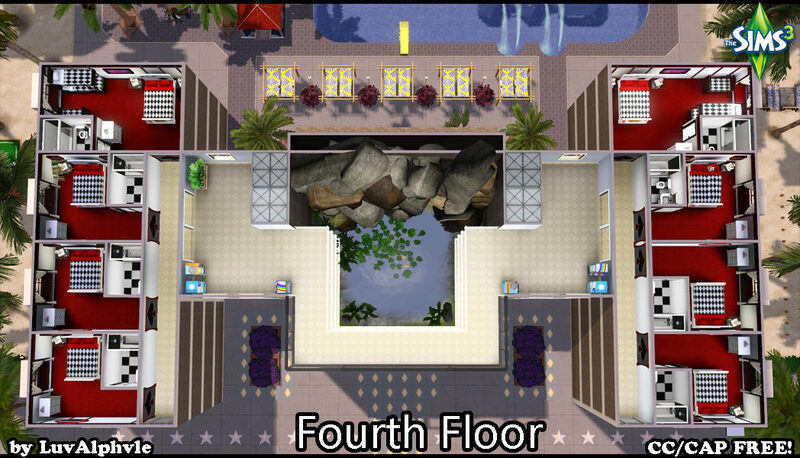 ● Basement: Five fully upgraded beach towers are down below, accessible by elevator. Spa treatments and spray tans galore! You can't go home without a tan - how will your friends be able to tell you went somewhere expensive? ● Pool Area: If you're looking for your vacation to go swimmingly, you’ve come to the right place! Dive right in and enjoy some of our pool activities. Our wave station allows you to to hone your surfing skills without that long drive to the ocean or the crowds o the beach. Enjoy a long, hot soak in our hot tubs or relax under our poolside cabanas. If you're thirsty, don't bother leaving the pool - swim right up to the pool bar and place your order! Poolside food stations are available so you can refuel without breaking stride. Do you think you're brave? Prove it with a brisk stroll over hot coals. Other available activities include horseshoes, golf, Gnubb, and more!